Investing Advice And InformationEconomic NewsThe Government Can Seize Anything, Including a Skyscraper! In recent times, law enforcement has gotten out of control. Police have been emboldened by SWAT teams, aggressively discriminate against minorities and engage in abusive tactics such as “no knock” raids, “stop and frisk,” asset forfeiture laws and a variety of other ways to trample upon our sacred Bill of Rights. 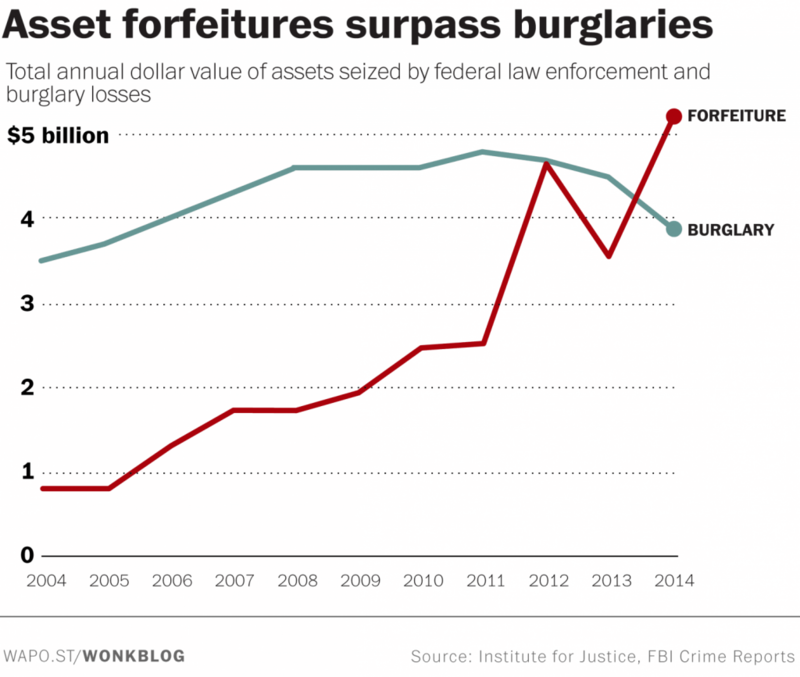 One good example of overreaching police action is asset forfeiture. In the name of catching drug dealers, tax evaders, terrorists, or just plain law breakers, police can confiscate cars, houses and cash without a court order or without even charging someone with a crime. In fact, the feds this year confiscated an entire skyscraper, a 36-floor building at 650 Fifth Avenue in New York, because the part-owner was linked to a money-laundering scheme of an Iranian terrorist group. In 2014, for the first time ever, the government seized more property than burglars stole from private homes and offices! According to the Institute for Justice (a sponsor at this year’s FreedomFest conference), the Treasury and Justice Departments deposited more than $5 billion into their respective asset forfeiture funds. That same year, the FBI reported that burglary losses topped out at $3.5 billion. If you do the math, the government seized over 40% more property than burglars did! Fortunately, citizens have had enough and many legislators are repealing these clear violations of our right to property. In states like Texas and North Dakota, the legislatures are enacting laws and measures with the aim of curbing these outrageous practices. Sadly, President Donald Trump seems to be unfamiliar with the abuses and is a supporter of asset forfeiture laws. One sad effect stemming from of all this unwarranted police action and asset seizure is that the United States currently has the largest prison population in the world. More and more tax money from hardworking Americans’ pocket books is being used to support this growing populace behind bars. I’m really looking forward to an event at this year’s FreedomFest conference, which starts in two weeks, where the police and their behavior recently will be put on trial. Larry Elder, the Los Angeles-based Salem Radio talk show host, will have his hands full defending the police. Kennedy of Fox News fame is set to judge this year. Whichever way it goes, and whatever your personal viewpoint is, the mock trial is going to be great fun. In case you missed it, I encourage you to read my column from last week about what the U.S. can learn from Canada’s bi-partisan problem solving. Investment expert Jim Woods shares the details on this health care fund that could bolster your portfolio.